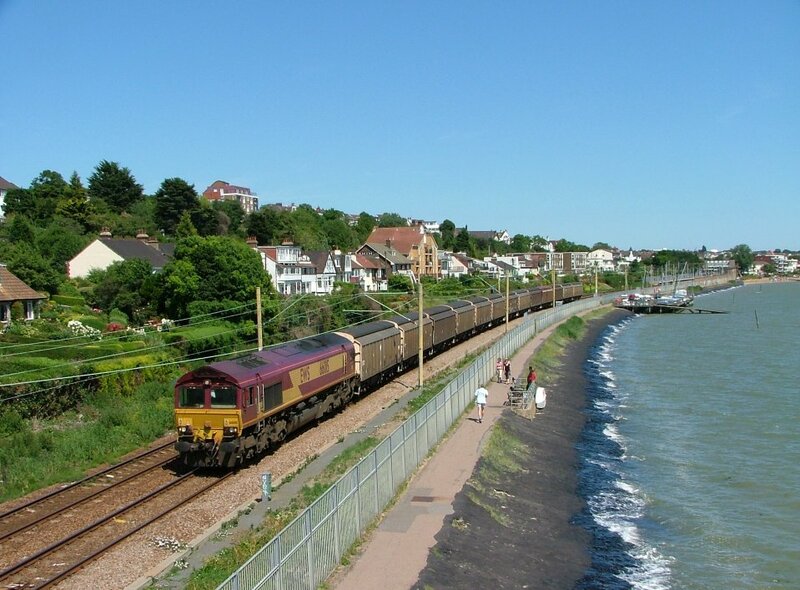 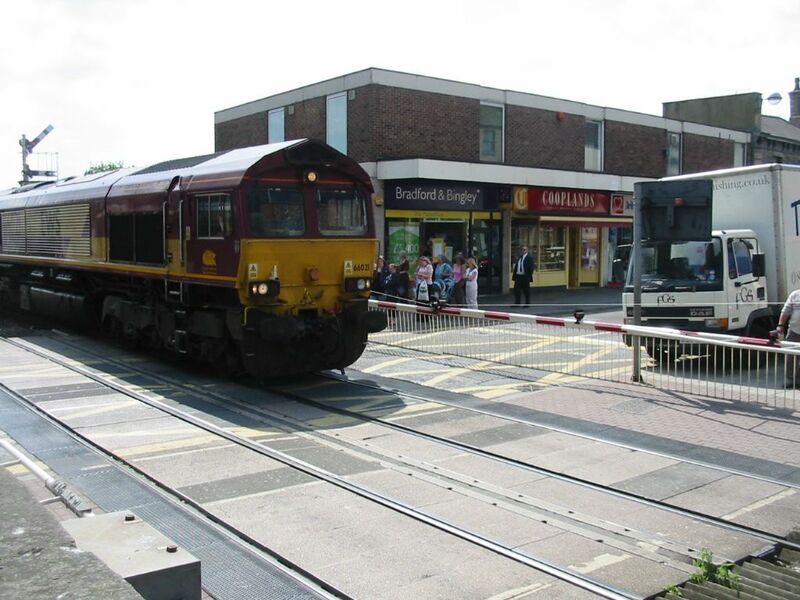 You do not get many freights on the LTS Line at Chalkwell so to see this 'as and when required' MoD from nearby Shoeburyness headed possibly by 66025 was something of an unexpected bonus....the date June 28th 2006. 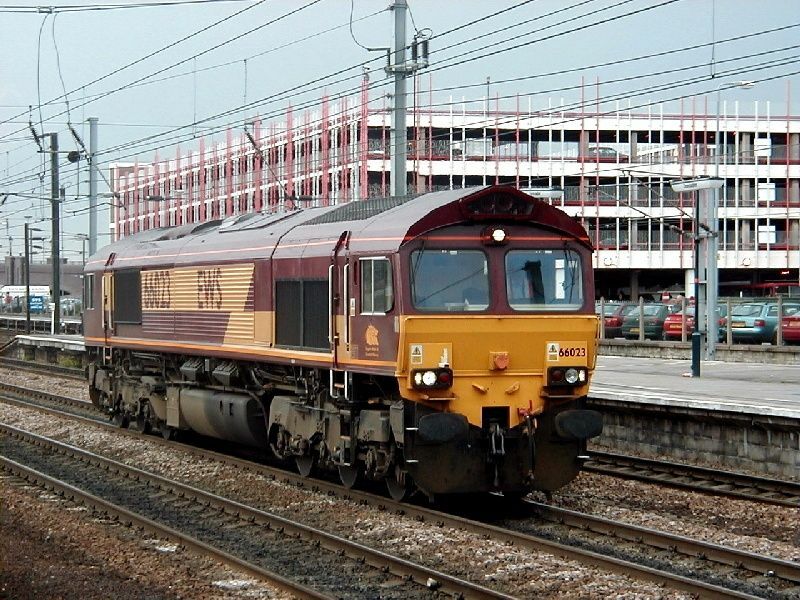 66012 with an engineering train passing through Crewe on Sunday 26/06/05. 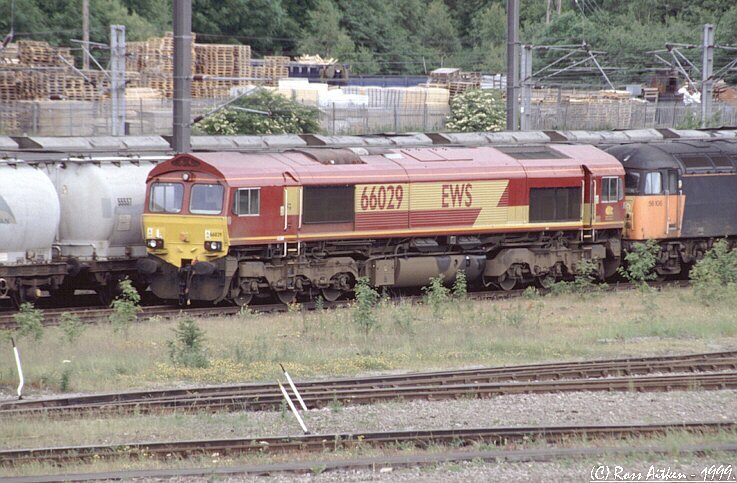 66013 lays over at Warrington LIP while awaiting it's next turn of duty on 14th August 1999. 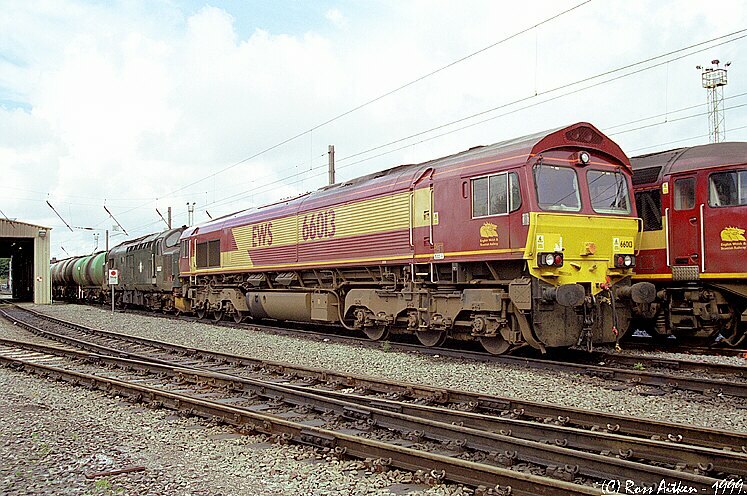 66013 stands with 37403 on a rake of petroleum tanks at Warrington LIP on 14th August 1999. 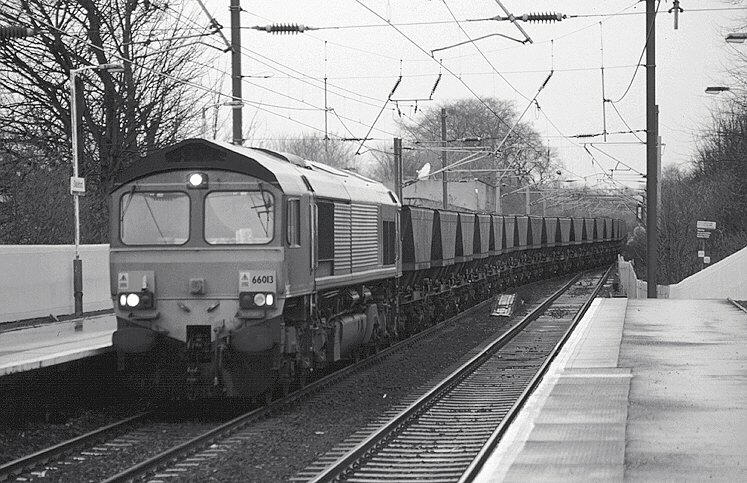 66013 passes through Slateford station in Edinburgh with an unidentified eastbound M.G.R (coal) train on Monday 10th January 2000 @ 12:46. 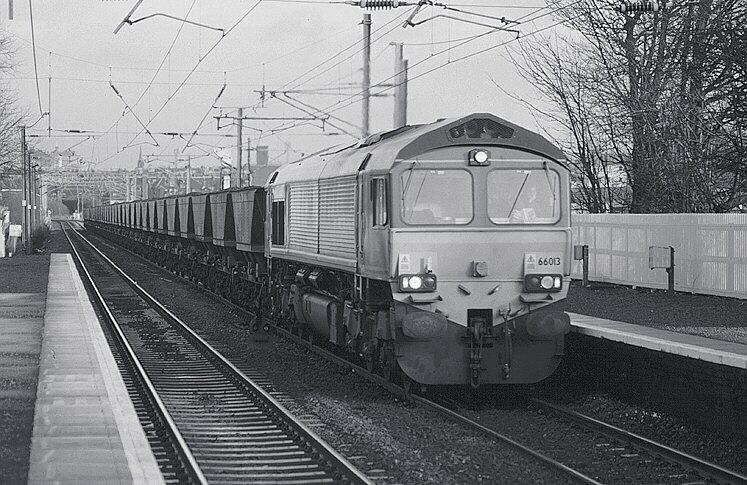 66013 passes through Slateford station in Edinburgh with an unidentified westbound M.G.R (coal) train on Monday 10th January 2000 @ 13:20. 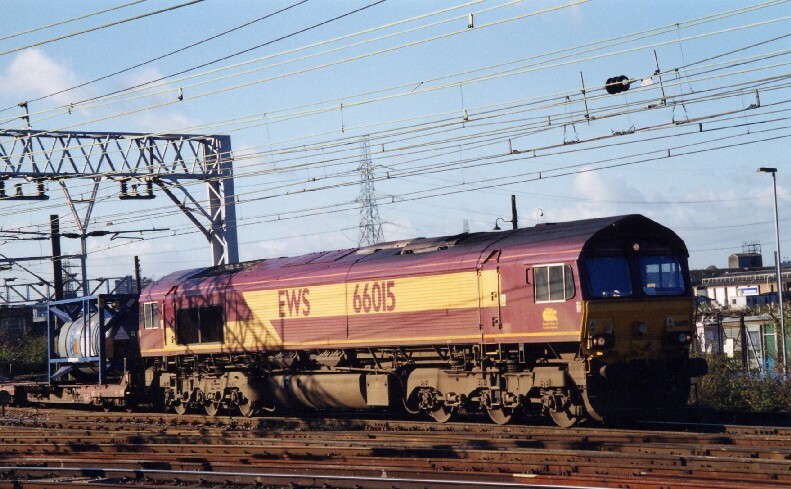 66014 stands at Knottingley depot on Sunday 14th November 1999. 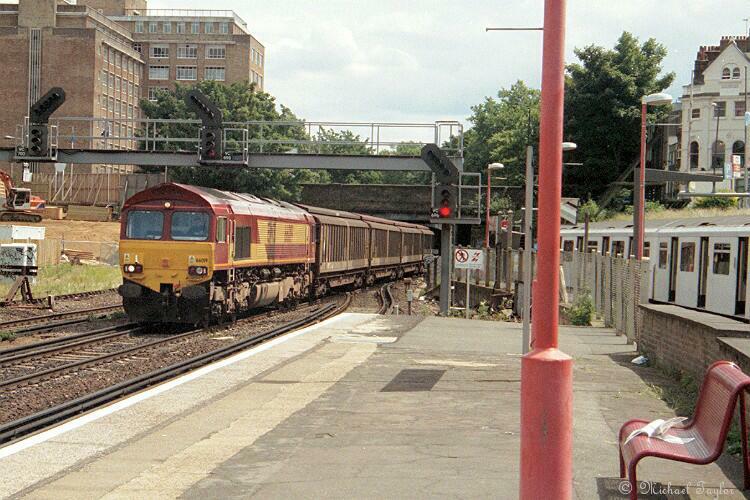 66015 comes off the North London Line at Stratford E.London and heads out east in November 2002. 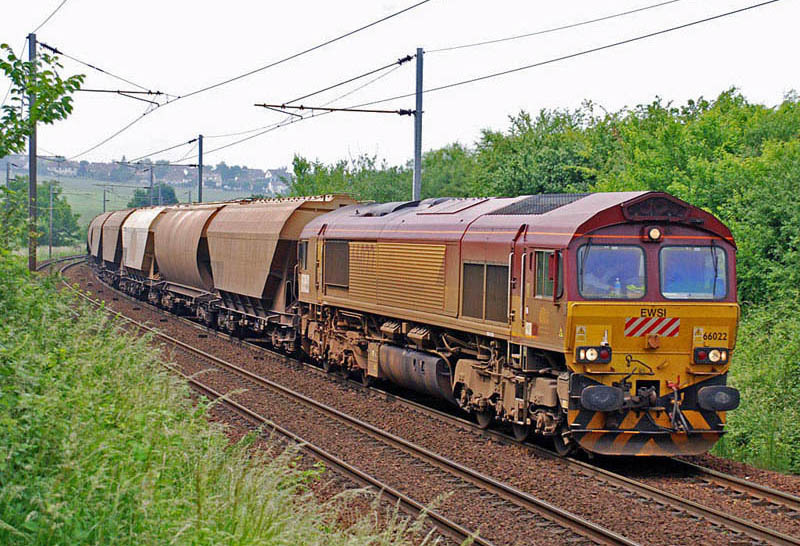 EWS Class 66 - 66016 passes through Newcraighall station at the head of a rake of HTA 'Coal Hoppers' on Tue 6th Mar 2007 at 11:02. 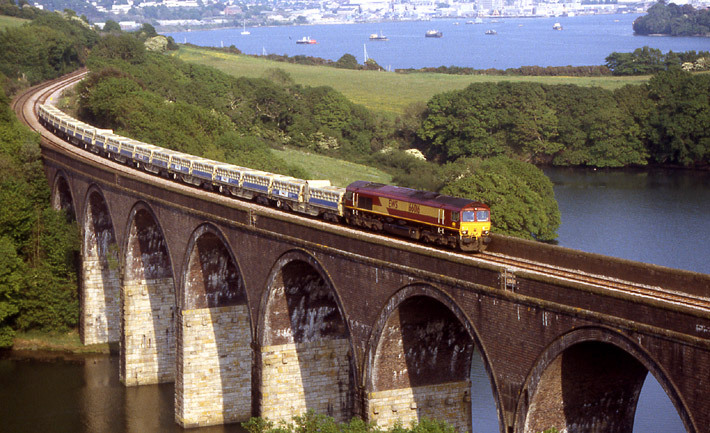 66016 crossing Forder Viaduct with a ballast train from Meldon Quarry in Dartmoor, to St Blazey on 17 May, 2004. 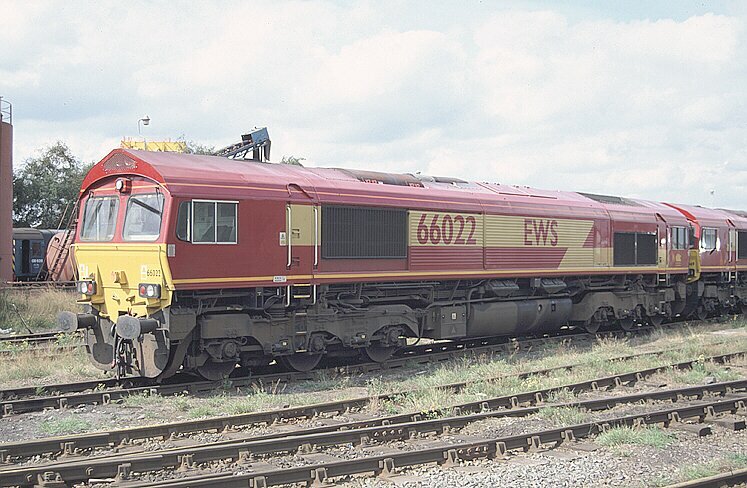 66017 at Newport, October 2001. 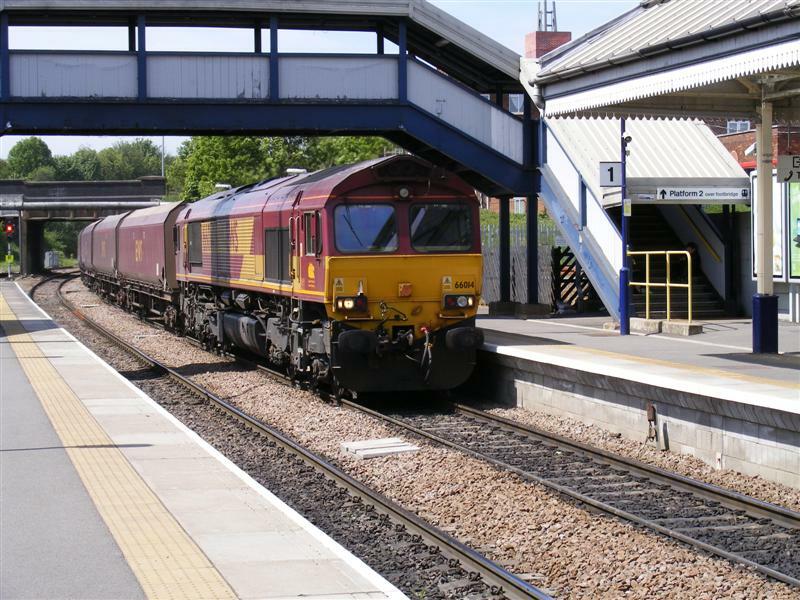 EWS 66018 heads south through Ely on the 20th August 2004. 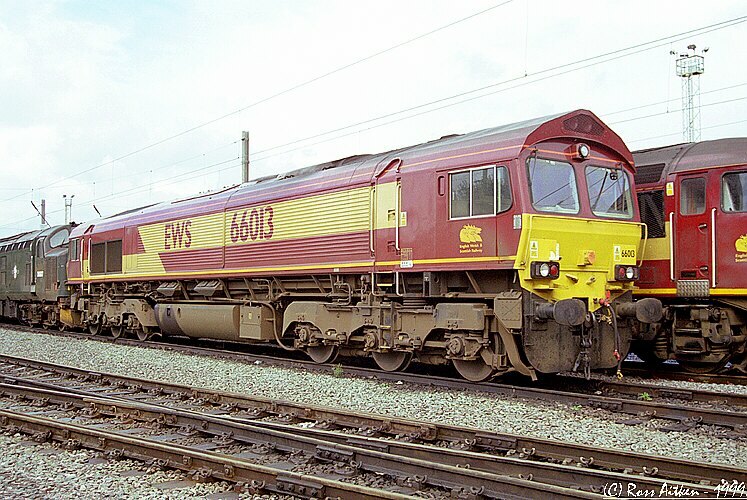 66020 stands in Bescot Yard on Saturday 16th October 1999. 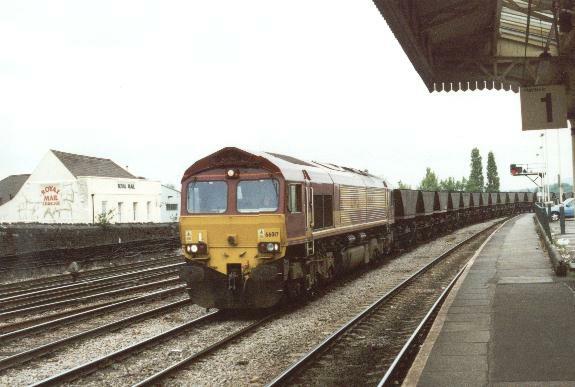 66021 stands at the head of a rake of coal hoppers while stabled at Worksop on Sat 5th June 1999. 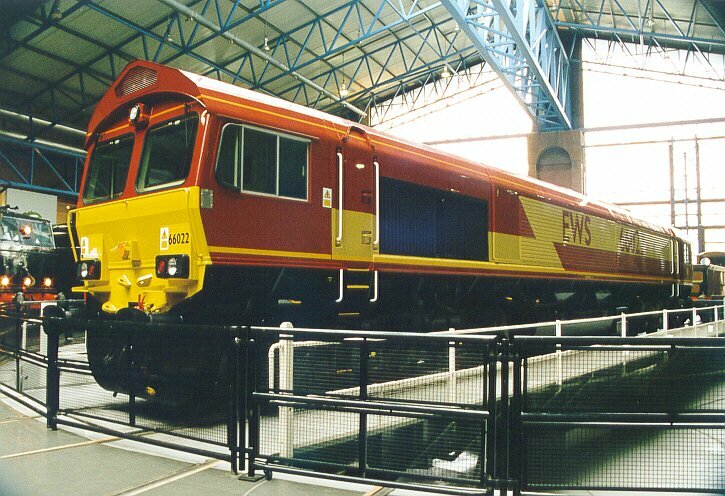 66022 stands on the turntable in the Main Hall at the National Railway Museum on Sun 15th Nov 1998. 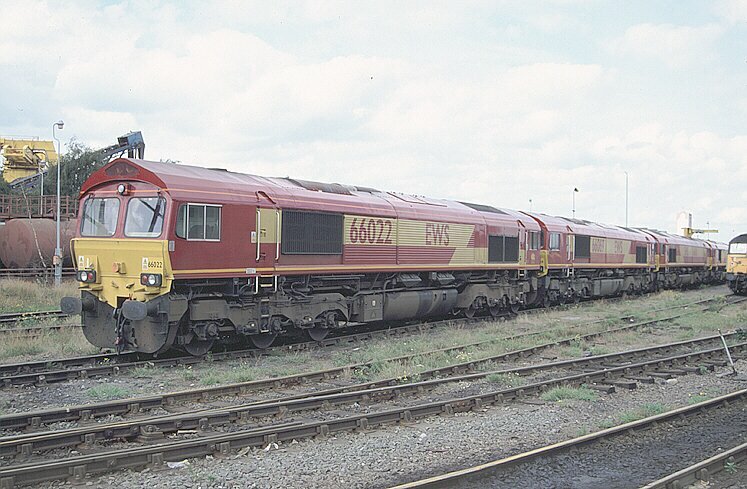 66022 awaits it's next turn of duty at Saltley depot, Birmingham on Sun 12th September 1999. 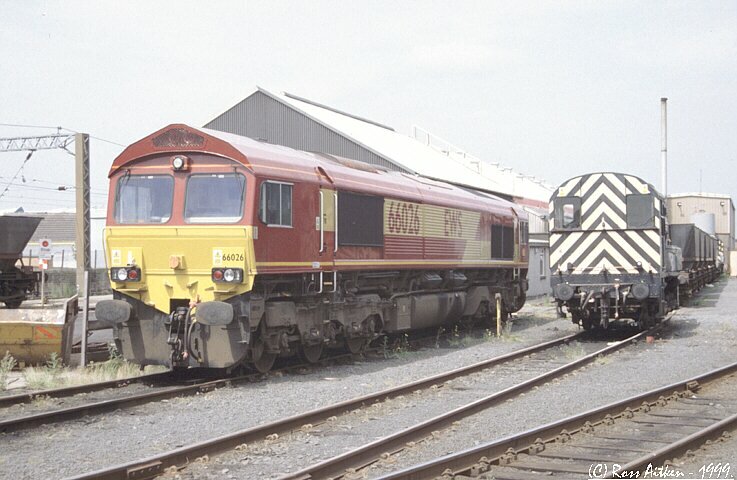 66022 stands with 66069 & 66106 at Saltley depot, Birmingham on Sun 12th September 1999. 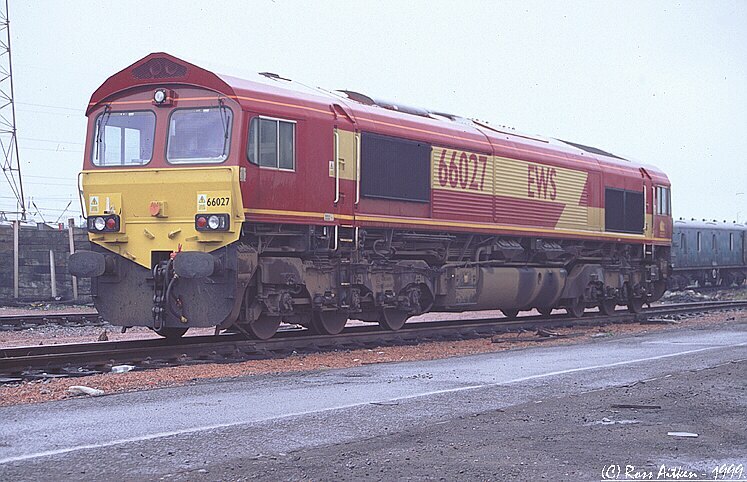 66026 stands alongside 08881 at Ayr T&RSMD on Saturday 26th June 1999. 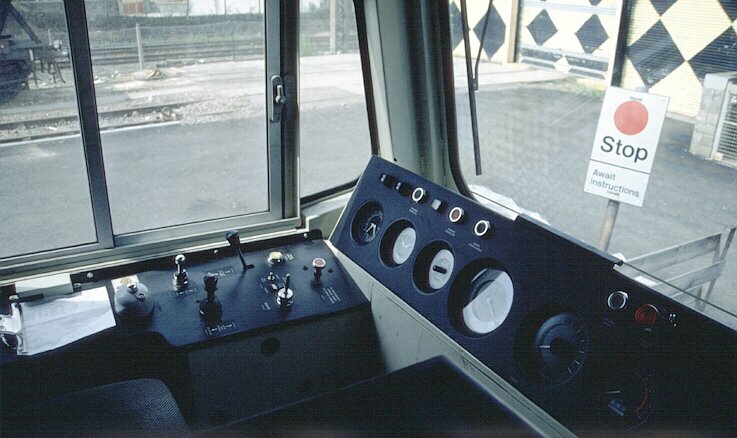 Cabview - EWS Class 66. 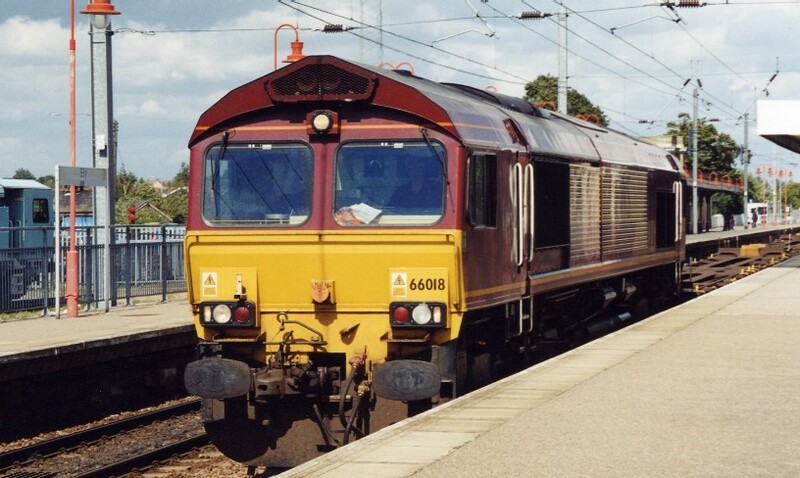 Cabview of the drivers side of 66026 at Ayr T&RSMD on Saturday 26th June 1999. 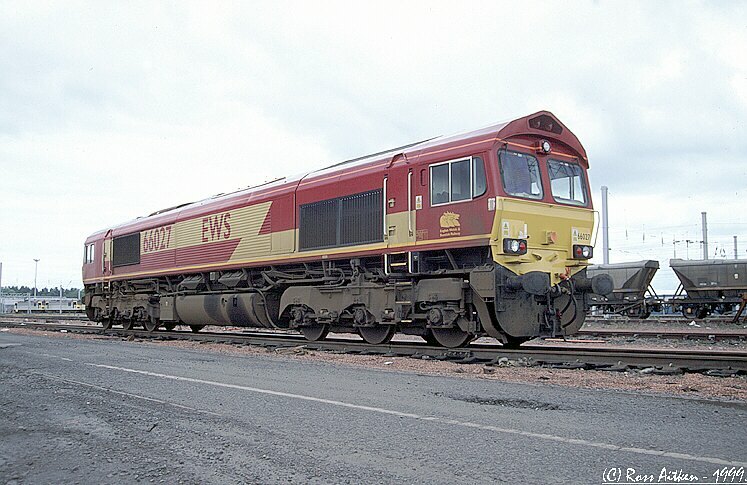 66027 stands at Mossend Yard on saturday 24th July 1999 while awaiting movement to Motherwell TMD for repair on saturday 24th July 1999. 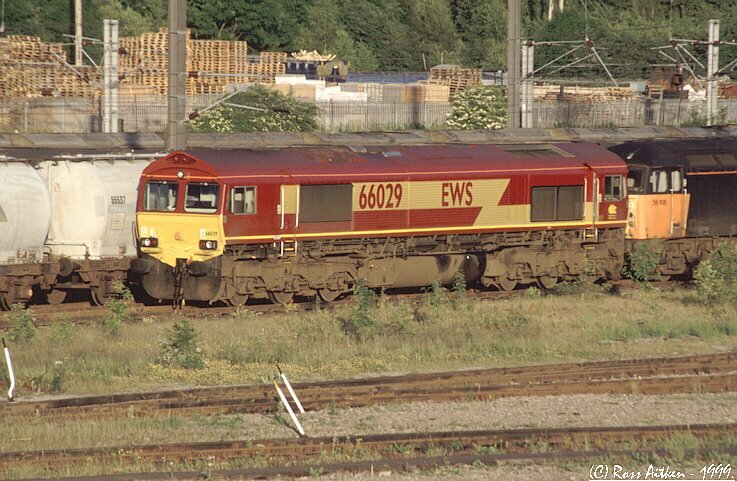 66027 stands at Mossend Yard on saturday 24th July 1999 while awaiting movement to Motherwell TMD for repair on sunday 25th July 1999. 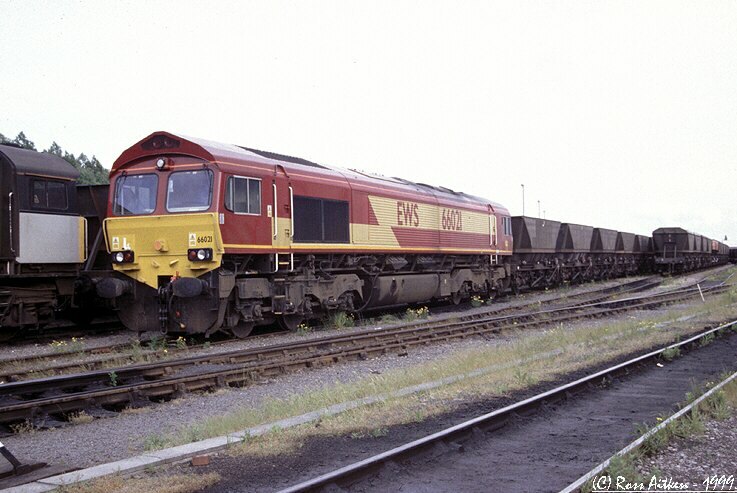 66029 stand at Tyne Yard train on Sunday 13th June 1999. 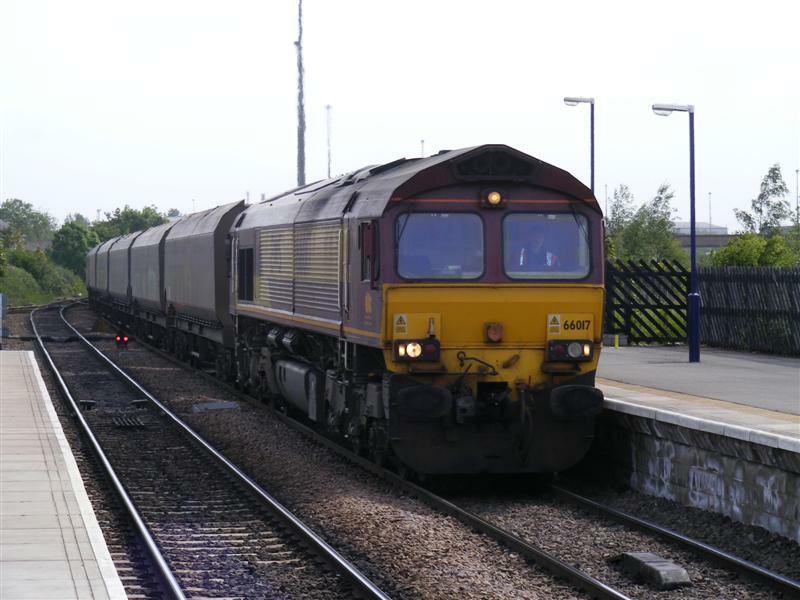 EWS Class 66 locomotive 66027 spent several hours shunting various wagons around and between sidings at Westbury station in Wiltshire. 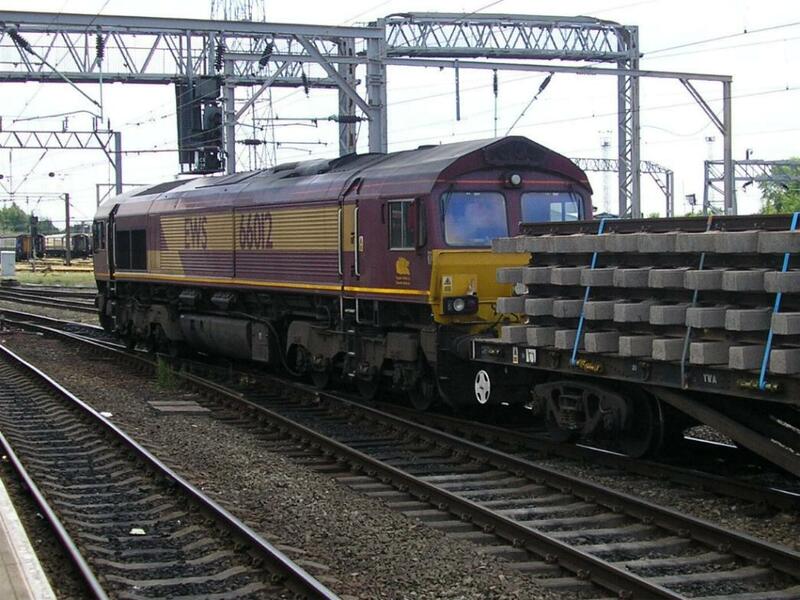 Here it is pushing a rake of ballast wagons into one of the Up sidings. 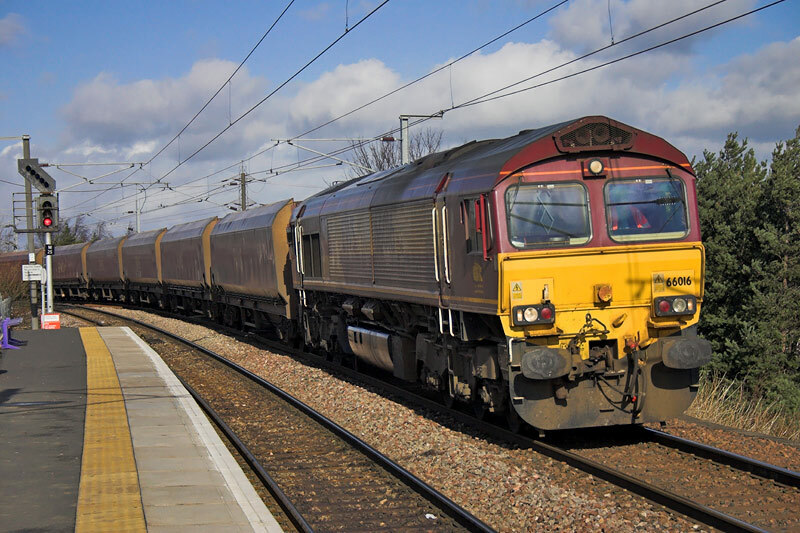 Photo by Chris McKenna 03/03/2006. 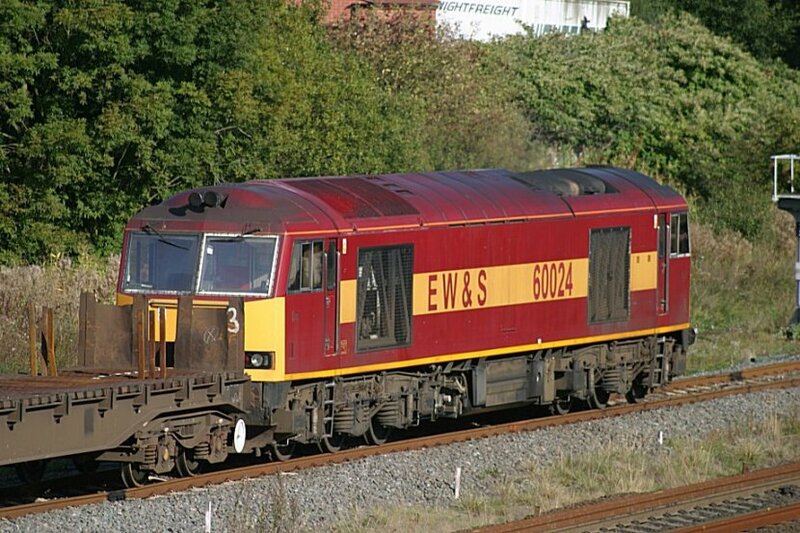 EWS Class 66 locomotive 66027 spent several hours shunting various wagons around and between sidings at Westbury station in Wiltshire. 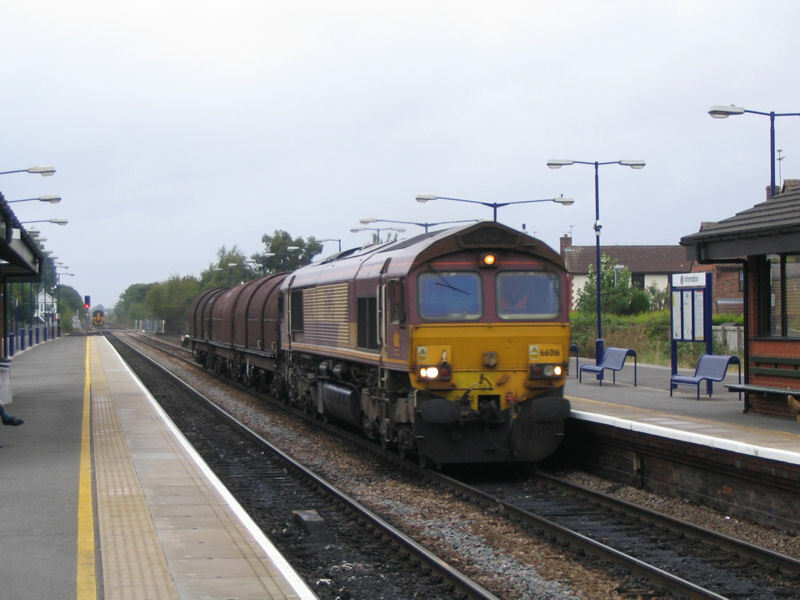 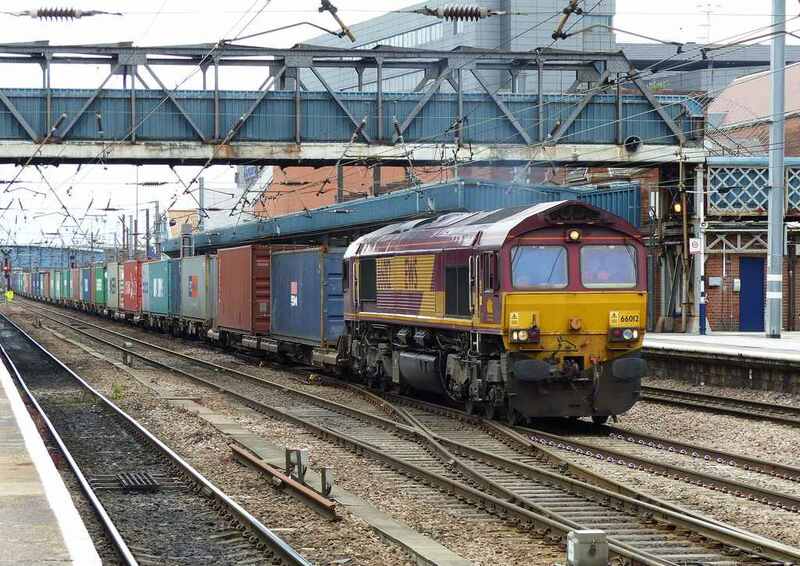 Here it is pushing a rake of ballast wagons into the Up sidings. 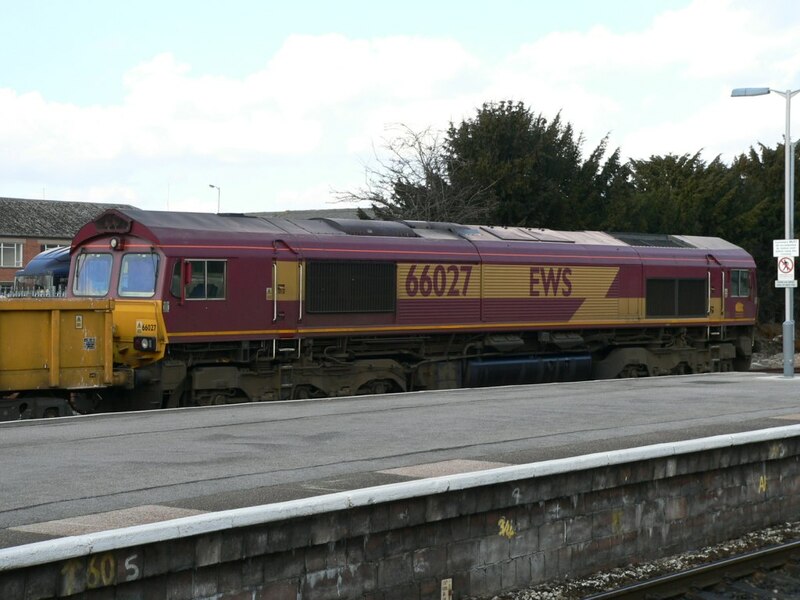 EWS Class 66 locomotive 66027 spent several hours shunting various wagons around and between sidings at Westbury station in Wiltshire. 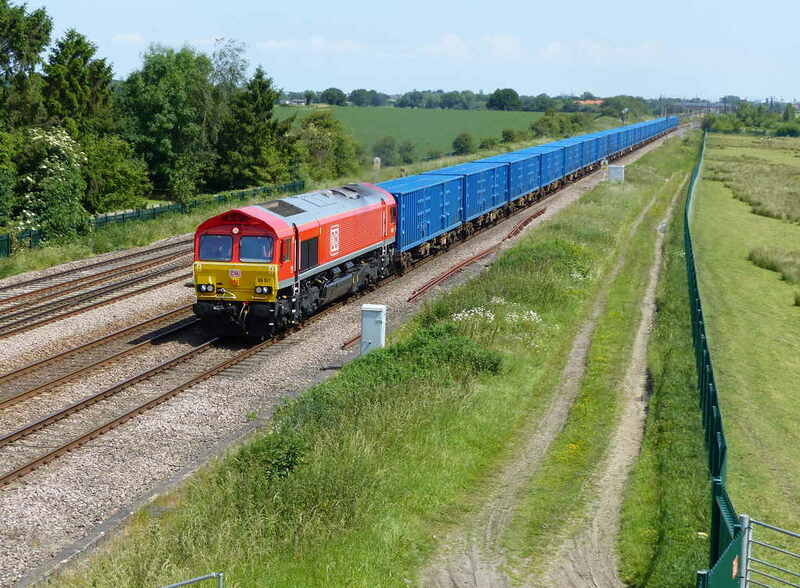 Here it is light engine while running around a rake of (I think) ballast wagons. 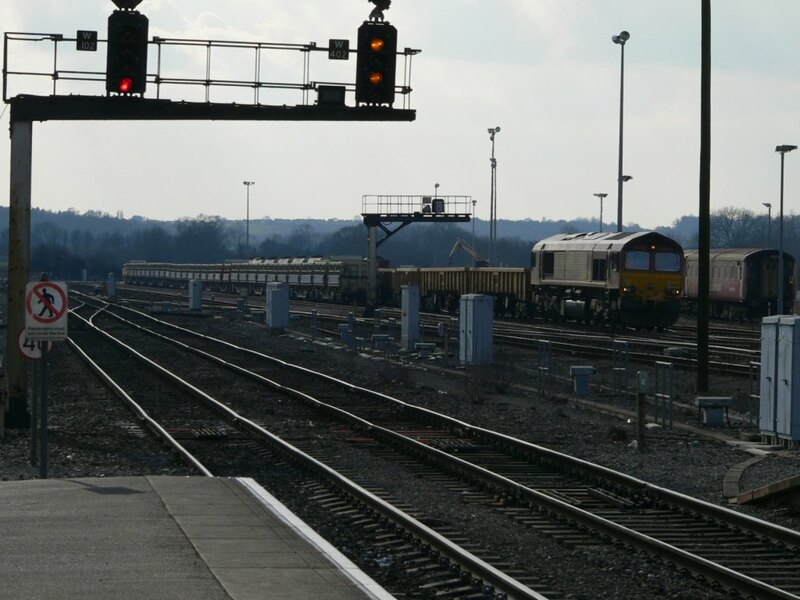 60 024 seening heading north at Clay Cross Junction, this loco has been put in a refuge for the Voyager to overtake it. 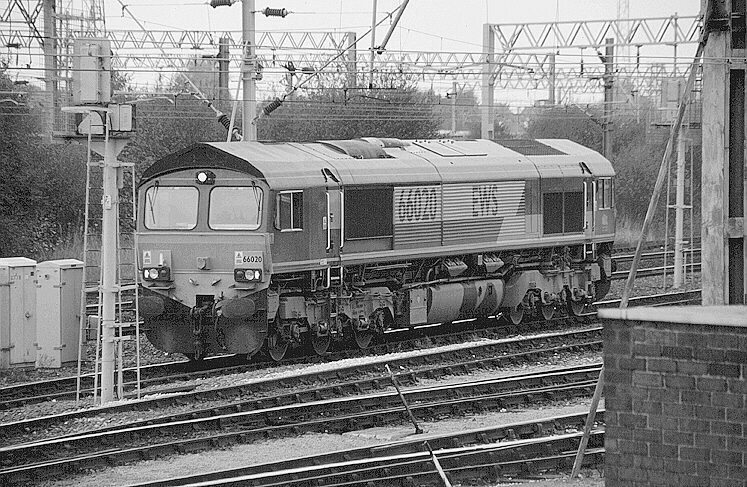 Clay Cross Junction is the divergence of the Erewash Valley Line and the Midland Main Line. 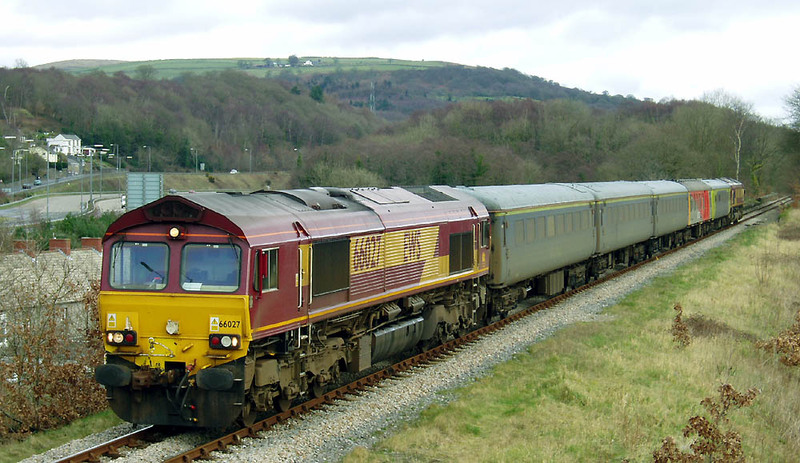 The Serco track recording train on the Vale of Neath line in South Wales. 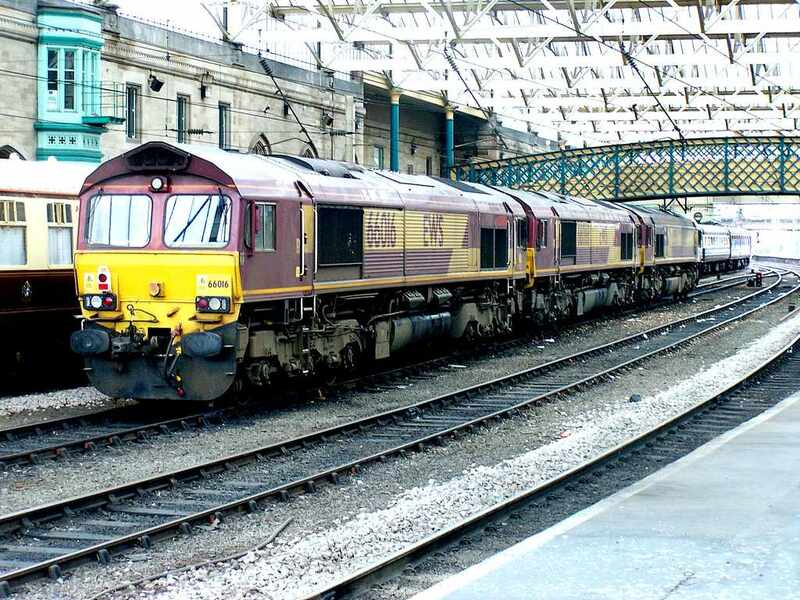 Headed by 66027 with 66030 at the tail. 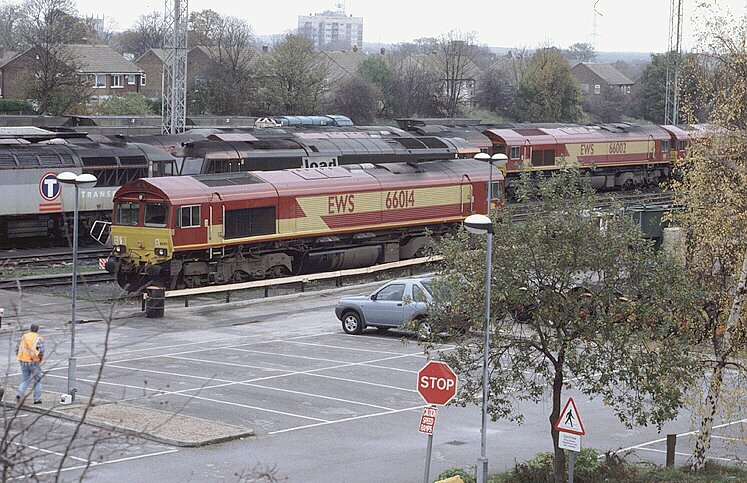 DB999508 is the recording saloon with some old MkII's in the formation to make up the brake force.